We have been asked to give everyone a helping Hand to get to the fight, so for the travelling fans Here it is! Chris enjoyed a great reception when he captured the WBF World Title in Castlebar, more of the same please!! If you are looking to get to Grays from Chester then get in contact with CHESTER BOXERS. Steve and the Guys are organising some Luxury coach transfers to and from the venue on a first come, first served basis CALL 01244342012 to Book. ACCOMMODATION: The Park Inn by Radisson has Advanced rooms available on www.laterooms.com for Just £45 for the night of the Fight. This hotel is less than 2 miles from the Venue. BY TRAIN: Grays Essex is best Serviced through London terminals and The Trainline are offering some great prices on train tickets going to London Friday and coming back on Saturday. The other option you have, other than some other local accommodation, is to stay in London. However, please check train times as the latest train back to London is at 23:30 to Fenchurch Street Station. You can Book and Check Train times using The Trainline. THE VENUE: Grays Civic Hall is a great Venue. It’s easily reachable and is on Blackshots Lane in Grays. Click HERE for a Map of the Local Area. TICKETS: If you are local and looking to buy tickets you can contact Chester Boxers on 01244342012 who can arrange tickets from Chris’ allocation. Prices vary so call for details! 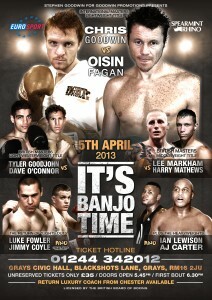 To Read the Excellent Interview by IrishBoxing.com on the fight click here. Fight Options also will be uploading an exclusive video chat with Oisin soon so keep an eye out fopr that. Oisin was in great spirits and is looking forwards to providing his fans with a trip worth taking and adding a “Signature” win to his list. Don’t Miss it!